By now I bet you probably know how important sunscreen is so I won’t repeat it. Instead I am going to talk about how important non-toxic and natural sunscreen is. But first, some background. I have two energetic boys who love being outdoors and have a weird love affair with swimming pools. I love that my boys prefer playing outside than watching TV. But living in Guatemala, where sun shines year round, I need to keep them protected. Sunscreen is something that I put on them every day. long run. I mean, who knows how much damage chemicals from regular sunscreens can cause. That’s why I am always searching for brands that offer organic, non-toxic products. Not long ago I was planning a trip to Florida and I knew that sunscreen was a must, but I was nearly out of the one I had. This gave me the opportunity to get on the internet to try to find something new but still safe for my whole family. This time I found four options that I really liked. 1. 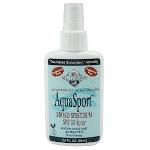 Aqua Sport – This claimed to be a waterproof naturally safe sunscreen. So it was tested during a pool day. Since it is spray it goes faster into the skin, so the boys didn’t have to spend those long minutes of torture waiting for it to be absorbed by their skin. I loved being able to spray them every time they wanted to eat or go to the bathroom. Plus it worked. No sunburn to deal with at night. 2. 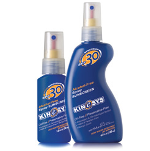 KINeSYS Performance Sunscreen – This is supposed to be for people that play some sports of all sorts, and I consider running after my boys at some park a sport, especially in a tropical place. It is always so hot and you end up sweating a lot. And most sunscreens get washed off with a bit of sweat, that’s why I loved this one for our adventures. 3. 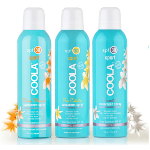 Coola Spray – This is also a water resistant sports sunscreen made of natural ingredients. What makes it different is that a few of its ingredients are also anti aging components. This was my personal favorite. As you can see they are all sprays. I love how easy and quick they are to apply. As a mom I hate that moment of having to rub sunscreen all over my kids. It is an awkward moment when they keep complaining and moving. But if you prefer using a cream on yourself I also found an organic option that works better than it should. 4. 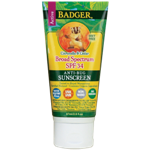 Badger Balm Bug Repellent Sunscreen – It felt like a dream come true when I found it. I always get eaten up by bugs when I travel. They seem to love my blood. Plus I don’t get a lot of time for myself, because I have to keep an eye on the boys. So having one product that did both things was a blessing, I can protect my skin and keep bugs away in one step. Four bottles of sunscreen might sound a bit excessive for one trip, but keep in mind that there were four of us, and we used them at least twice during the day, by the time we got home they were almost empty. Stats on Summer Road Trips: Where Are You Going?